“Have you seen the sky?” That was “Breaking Bad” creator Vince Gilligan’s answer when asked why he chose to film in and around Albuquerque, New Mexico. People lucky enough to have visited New Mexico know what he means. The Big Sky State of Montana owns the nickname and is home to some of our favorite places. New Mexico is serious competition. At an average elevation of 5,700 feet above sea level and 335+ days of sunshine a year in many places, New Mexico presents the sky as artist’s palette and lover’s waltz. Have you seen the sky? Join us as we do our best, through words and pictures to show you what Mr. Gilligan meant. According to the state’s license plates, New Mexico is “The Land of Enchantment.” Color The Greatest Road Trip Ever Taken enchanted. New Mexico was admitted to the union as the 47th state in 1912 but, before that, was part of the independent Mexican Empire and the Federal Republic of Mexico. It’s wide open spaces make it immediately apparent that this is a rural bastion in the American southwest. Fifth largest in area, New Mexico is the 14th smallest state by population. Colorado borders New Mexico to the north, while Arizona borders it on the west. Texas surrounds New Mexico to both the south and east. A tiny portion of Oklahoma is to New Mexico’s northeast. An equally tiny portion of the Mexican state of Sonora is at New Mexico’s southwestern door. The capital of New Mexico is Santa Fe, but the largest city is Albuquerque, the only New Mexican city with more than 100,000 population. Las Cruces will get there soon, though. New Mexico clings to the sky and only grudgingly gives up its elevation. The lowest point is at the Red Bluff Reservoir, on the Texas border, south of Loving. Even there, you will be 2,844 feet above sea level. The highest point is atop 13,167 foot Wheeler Peak, located northeast of Taos and just two miles southeast of the Taos Ski Valley slopes. The geographic center of New Mexico is located in Torrence County, 12 miles SSW of Willard. Mountain Time is the right time for all of New Mexico. The state does recognize Daylight Savings Time. Roswell International Air Center serves about 33,000 passengers a year. Many of them go to Dallas. Santa Fe Municipal enplanes about 65,000 passengers annually. The most common destination is Dallas. Albuquerque International Sunport serves 2.5 million customers each year. Phoenix is the most popular destination. Military/Politics: Dennis Chavez, Mangus Coloradus, Chief Victorio, and Harrison Schmitt. Actors: Demi Moore, Annabeth Gish, Adrian Greiner, Autumn Shields, Jace Norman, Alexa Havins, Willow Shields, Bruce Cabot, Chiara Aurelia, Anna Gunn, Kim Stanley, Austin St. John, French Stewart, and Neil Patrick Harris. Entertainers: Slim Summerville, Poppin John, Bri Bagwell, Juliet Doherty, Robert Williams, Stephen Meek, Demi Lovato, John Denver, Mason Rivara, Peter Hurd, and William Hanna. Authors: Linda Wertheimer, Thomas Weaver, Lauren Tarshish, and Robert Crichton. Athletes: John Madden, Bobby Unser, Arian Foster, Colt McCoy, Al Unser, Holly Holm, Hank Baskett, Ronnie Lott, and Ralph Kiner. At 7,000 feet above sea level, Santa Fe is the highest state capital in the U.S.
Each October Albuquerque hosts the world’s largest international hot air balloon fiesta. Las Cruces makes the world’s largest enchilada at the “Whole Enchilada Fiesta,” also in October. Only .002% of the state’s total surface area is covered with water, by far the smallest percentage in the nation. In spite of this, the town of Deming holds annual duck races. In 1950, a bear cub was found trapped in a tree when his home in the Lincoln National Forest was destroyed by fire. He was to become Smokey the Bear. 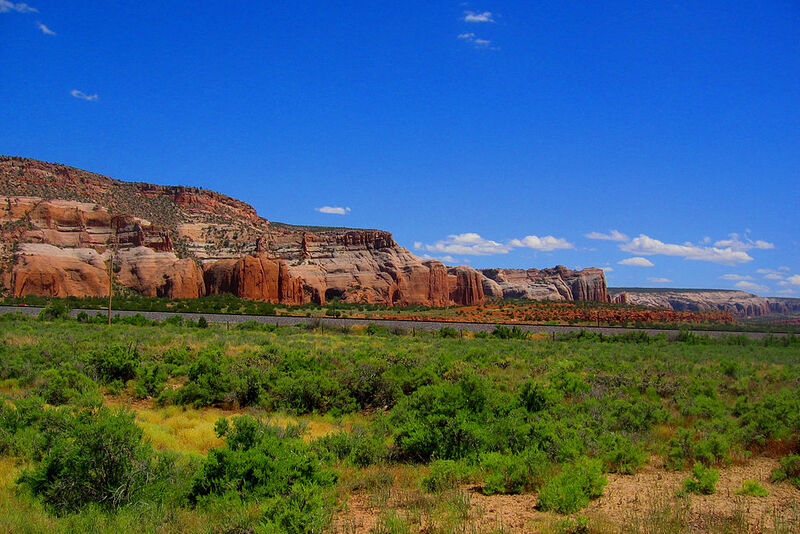 The Navajo Nation has a reservation in New Mexico that covers 14 million acres. New Mexico is, officially, a bilingual state, and one in three households speaks Spanish as a primary language. As late as 1888 there was not a single public college or high school in what would later become New Mexico. 75% of the roads in New Mexico are unpaved. The dry climate keeps them intact. Let’s get this party started! When Ted Geisel (Dr. Seuss) wrote “Oh the Places You’ll Go” he could have been talking about New Mexico, all by itself. Our trip will cover 641 miles. On the way, we’ll see some amazing folk art, a cave that could encompass a small nation, and some out-of-this-world stuff that can only found here. Let’s go, go, go! We will start in the one place that epitomizes this part of the country. Four Corners Monument is the one place in our great country where four states come together. We could have chosen to visit Four Corners when we were in Utah or Colorado, or we could have waited until Arizona. Somehow, New Mexico seems the right place to make this momentous stop. There are no ferris wheels, roller coasters, or log flumes. In fact, there is a sacredness to it. This is the thumbtack of the American southwest and has been called the nation’s intersection. The Monument is open year round and features a Demonstration Center with Navajo artisans. Navajo vendors nearby sell handmade jewelry, crafts, and traditional Navajo food. It is a great place to begin our trip through this unique state. Our first day will take us more than four hours across the northern half of New Mexico. Around each corner is a vista that takes our breath away. The best part of today’s drive is crossing the Rio Grande Gorge Bridge. Almost to Taos, it is a beauty and an awesome picture-taking opportunity. One of America’s highest bridges, this impressive overpass spans the Rio Grande Gorge far below. A few minutes later we arrive in the city of Taos. Here we will step back in time a few years. Like 170 years. The Kit Carson Home and Museum is our destination. It is a three-room adobe home, purchased by Carson in 1943 as a wedding present for his bride. The museum gives us a good history of Kit Carson’s life and the life of a 19th-century western pioneer. Named a National Historic Landmark in 1963, this is one of the best places to visit when out west. We’re going to spend the night at the Sun God Lodge for $65. Have you ever heard the expression “Half the fun is in the journey?” Well, you’ve never known it to be as true as it will be today. We are driving between Taos and Santa Fe. We have a choice of roads. They are, literally, called “The High Road,” and “The Low Road.” (The Scottish folks among us may know a similar song. We’ve chosen The High Road, but based only on the flip of a coin. When we come back another time, we’ll go the other way. They are both visually stunning. Officially, it begins at the intersection of U.S. 285/84 and NM-503. It continues along NM-503 to Nambé Pueblo. We will stop in Chimayo along the way and any other spot that looks interesting. This isn’t a day for speed. Rather, it’s a day for pondering the canopy before us. We won’t find a chain coffee shop anywhere along our route. That is somehow refreshing to know. In Santa Fe, we have two places to see. We’ll do one of them today, and one tomorrow. First, we’ll see the Museum of International Folk Art. Since opening in 1953, the MIFA has gained international recognition. It is home to the world’s largest exhibition of folk art. The collection of more than 135,000 artifacts is separated into four distinct wings. They are called the Bartlett, Girard, Hispanic Heritage, and Neutrogena wings. It is truly amazing to see and celebrate over a half century of creative works from traditional artists living in cultures all over the world. Tonight we will stay at the Silver Saddle Motel for only $58 a night. Matt McAndrew said it best on “The Voice” when he sang “Take Me to Church.” That’s what we’re going to do today. To be more specific “The Cathedral Basilica of St. Francis of Assisi” is our first destination. While we aren’t Catholic in particular, we appreciate sincerity in all genuine religion, and this is an excellent stop. Visitors quietly enjoy the beautiful religious art, pray and/or meditate, and light candles if they wish. The story of St. Francis is an inspiring one, relevant to all faith traditions. This is both a lovely tribute to the man and a vibrant and active current faith community. It’s a place of peace in a world too often fraught with strife. What was that line from Monty Python? Oh, that’s right. Now for something completely different. We’re going to Roswell. In mid-1947, something large crashed into a ranch near Roswell. The United States’ government’s official stance on the matter is that it was a weather balloon. Claimants that will not be silenced loudly and insistently declare to have been an extraterrestrial spaceship. Do you believe the government? Or do you believe people who know people who know people who know stuff? That’s what we’re here to investigate. We don’t say this lightly. After all, The Greatest Road Trip Ever Taken is an important scholarly endeavor. That said, some of this stuff blows our mind! We will take at least two hours to read and digest the theories, facts, and everything in between. We said at the beginning of our journey that we wanted to see the offbeat and bizarre. This is all of that. We have a full day at Carlsbad Caverns tomorrow. So, we’ll drive as far as Carlsbad and stay at the Sleep Inn and Suites for $118 a night. There are holes in the rocks, there are openings in forest walls, and there are caves…and then there is Carlsbad Caverns. Are you an amateur spelunker or a curious tourist? No matter, this place is worth a stop. Is it a park or a cave? Yes, and more. Carlsbad Caverns National Park features rocky slopes and canyons. There’s cactus, grass, thorny shrubs, and the occasional tree, but who could guess at the hidden treasures deep underground? Beneath this rugged land is more than 117 known caves – all formed when sulfuric acid dissolved the surrounding limestone. Carlsbad Caverns is the best caving experience in the United States, bar none! We’ll do this baby right! We walk down into the cave through the natural entrance. It is about 750 feet down and is very steep at times. The total distance traveled to get down is about 1.25 miles. It may take us 1.5 hours. The cave is cool (56 degrees), but we won’t need heavy coats since we’ll be walking most of the time. We want to take our time and really soak up the experience. The views are totally different as we turn left and right. Once we get to the Big Room, (that’s the main room at the bottom), the hiking is almost level. Are you claustrophobic? Maybe a little? Don’t worry about it. Unlike in some other cave systems, Carlsbad Caverns are huge! A walkway leads us through many fascinating formations, shapes, and sizes of stalagmites and stalactites. Don’t forget the colored and petrified guano. Lots of that nonsense here! It’s great! We hope you enjoyed New Mexico and were positively enchanted by what there is to see. It is said that once you see New Mexico you may never want to leave. Hyperbole? We thought so too…until we saw New Mexico.